Categories: board, family, strategy, bidding. Ra consists of a small board and 180 tiles. The board has two tracks, the auction track contains the set of tiles up for bid and the Ra track contains the Ra tiles that show how many turns are left in the round (which is called an Epoch in the game to give the game that Egyptian flavor). 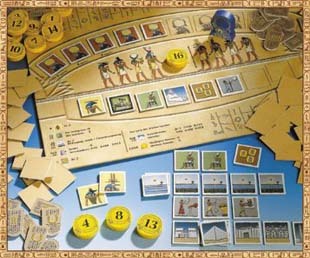 The tiles are beautifully rendered with thematic artwork by Franz Vohwinkel and fall into 6 scoring categories: Pharoahs (25 tiles), Niles and Floods (37), Civilizations (25), Monuments (40), Gods (8), Gold (5). The rules for scoring these tiles at the end of the round are printed along the sides of the board. For instance, the player with the most Pharoahs scores 5 points and the player with least loses 2 points. Another example is that 3 different Civilizations scores 5 points, 4 scores 10 points, and all 5 score 15 points. Players with no civilizations lose 5 points. Also included in the mix are 10 Disasters which each destroy 2 of the scoring tiles and 30 Ra tiles which force an auction and accumulate in the Ra track to march the round to its end. In the 5 player game 10 Ra tiles ends the round (9 and 8 tiles in the 4 and 3 player games). Finally, there are 48 tablet tiles in several denominations which are used to keep track of the game score. These tablets also lend a sense of the Egyptian atmosphere. exchange one of your god tiles for a tile on the auction track. Normally players want the auction pot to grow, and so they place tiles on the auction track. However, many times players in weak positions invoke Ra to cause the auctions to occur early and give the stronger players a weaker pot. One thing I haven't explained is one of the most interesting features of the game. The auction is a zero-sum game done with hefty wooden blocks called Suns. The Suns have values from 16 down to 1 with the highest value winning the auction. All auctions are once around auctions begining with the player to the left of Ra and ending with the player who invoked Ra. The interesting game feature is that the winning Sun tile is placed face up in the center of the board to become part of the next tile auction. Thus, the mighty 16 Sun that you use to win this auction becomes part of the next auction. Since each player has at most 4 Suns per round, the lowly 1 Sun can often be used to win a bad pot linked by fate with the mighty 16 Sun, leaving the player in a better bidding position for the next round. There you have the mechanics, but what about the game? First, I truly like the multiple paths to scoring in this game. Some players try to go for all types of tiles, but the scoring system is tweaked to be slightly out of reach of this strategy. Often, the big points come from specialization in certain sets, for instance, going after Civilizations. When a player attempts to do this, try to foil their bidding by upping the ante. For example, assume there is a juicy set of Civilizations, but you don't need them. You know a following player wants the Civilizations, and the player is showing a 2, 14, and 16 Sun. You can bid a 3 Sun to force the player to use one of his or her higher powered Suns. Juicy. Another nice thing about the auctions is that, unfortunately, many times a Disaster tile is mixed in with the set. The Disaster tiles often serve as a bitter pill to prevent players from trying to grow the auction tile set. A Good auction limiting game feature. The pacing of the game is excellent too. Within each auction there are many bidding questions to ask: does this tile set increase my standings, does this bid deny other player's standings, does the Sun exchange affect my future bidding potential, how many Ra auctions are left in the round? The 4 Suns are never enough to complete all tile categories, and one hates to use up a Sun prematurely because of the big penalty that you do not get to participate in the later auctions. Often the last two players in a round are in collusion, trying to create an auction pot as big as possible. The Ra tiles conspire to end the game early here. Even if the players ignore Ra and continue to let the auction pot build, the Ra tiles on the Ra track will end the round, sometimes with neither player getting any tiles. A fantastic game mechanism to move the game along! On the negative side, the complicated scoring mechanism often puts off newer players. I strongly suggest you use the Ra score mat referenced at the beginning of the review [Provided by Philip Dutré at http://www.graphics.cornell.edu/~phil/GM/introgames.html.] which will help new and experienced players sort the tiles and keep track of the score. Because the scoring at the end of the round is rather tedious, I recommend players jointly score the Pharoah tiles, and then each player individually score his set of tiles. This should help minimize the tablet tile exchanges, and keep tile discards in order. Like the tediuous counting and scoring mechanics of Sid Sackson's Acquire , I imagine a computer implementation of Ra would cut the game time in half. Aside from the slight ambiguites, usually present in every rule set, I find the english rules translation included in the Rio Grande Games version of the game to be wonderful. I love the two column format in which the detailed rules are contained in one column and a brief synopsis is contained in the other. This makes it easy to summarize the rules, or to look up and debate the finer points or stipulations of a given rule. I see this rules format in Torres and a few other games. Great job. 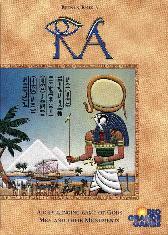 As with many Knizia games, players have criticized Ra for being an abstract game with a thin veneer tacked on. So be it! In this case, the veneer is very tasty. The art is coherent, bright and very unique. (Once again kudoes to Franz Vohwinkel.) For additional atmosphere, I suggest you play the opera Akhnaten by Philip Glass while playing the game. 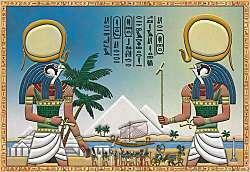 Or try translating the hieroglyphs in some of the artwork. Comparing once again to Medici and Modern Art , I think Ra has the strongest theme of the three. I guess I am just a sucker for the rich and interesting culture of the Nile. So there you have it, excellent abstract game, thin and colorful veneer, lots of bidding decisions, and the Ra clock quickly forcing each round to its conclusion. If you like bidding and auction games, this is a unique one that I am still investigating and enjoying every time we pull it off the shelf. Thumbs up! [an error occurred while processing this directive] Last modified: Thursday, 09-Jun-2011 12:36:56 MST.